“Enter the amazing world of foresight,” Isaac Asimov invites in his introduction to this extraordinary anthology, thus launching the reader on a rich and fascinating journey through the field of artificial intelligence. War with the Robots is a timely compilation of 28 of the best science fiction short stories on the subject of robotics and computers. Opening with Ambrose Bierce’s 1894 story “Moxon’s Master”—an early exploration into what happens when a human being invents a machine with intelligence—War with the Robots traces the development of human fears and fascination with this intriguing topic. Can a human-created form of intelligence overpower and destroy its maker? Are such forms of life inherently good or evil? Is it violating some deep and profound law to use human intelligence to create life? War with the Robots shows how yesterday’s future—our present—looked to writers earlier in the century, writers who often had disquietingly accurate vision. And it concludes with provocative suggestions by modern-day science fiction writers as they peer speculatively into our own future with robots and computers. War with the Robots is edited by Isaac Asimov, well-known author and father of Robotics; Patricia S. Warrick, scientist and author of The Cybernetic Imagination in Science Fiction; and Martin H. Greenberg, the foremost anthologist in science fiction today. 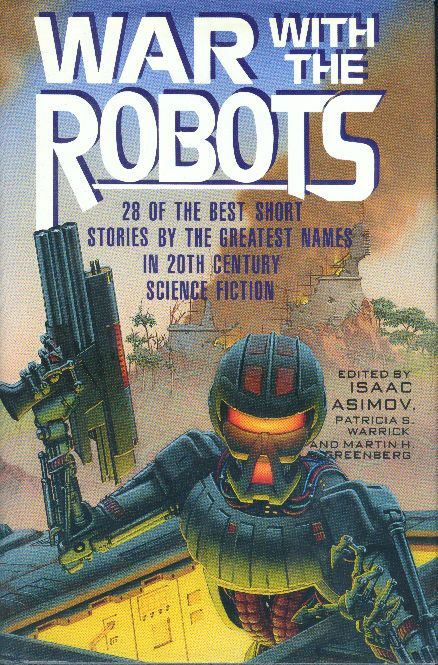 The most interesting thing about this anthology, however, is its fate as a hardback reprint: it was retitled War with the Robots and sports a garish cover with a machine soldier menacing the reader. This is certainly one of the more ludicrious cases of a publisher trying to make a book something they hope will sell and not at all what the people who put it together intended.